Posted June 23, 2017 by Norburn Lighting and Bath Centre & filed under Bathroom faucets, New Products . Riobel is recognized for their high-quality faucets and shower systems, with a talented team of designers, engineers, and technicians that facilitate the innovative direction and the standards of the company. 3D models are developed for each product which are tested at their technical centre. They ensure that their products withstand the level of quality, functionality, and appearance one expects from a Riobel product. In addition, Riobel has in-house carpenters that assemble each display stand to ensure consistent quality and brand image. 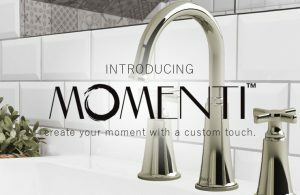 We are excited to introduce one of their new lines, Momenti, to our showroom that simplifies the steps to customizing lavatory and bath faucets in any home. The Momenti follows a simple process of choosing from two spout options, four handle styles, and up to seven finishes, creating up to 56 customized looks. This line is also made to measure, ensuring utmost customization that fits perfectly in your bathroom. Customized faucets enhance the appeal of any bathroom and is a detail that should not be forgotten. The process starts by selecting your desired faucet shape: choosing from a round or square design. Choose the handle style, from x-shape, t-shape, j-shape, or L-shape. Choose the desired metal finish: brushed nickel, brushed nickel/black, polished nickel, polished nickel/black, chrome, chrome/black, and black. At top right-hand side, choose different background images that might relate to your style preference, or actual sink. Check out the actual Riobel Momenti display in our showroom, and receive expert advice from our team. We are always happy to help! 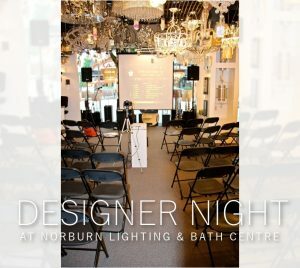 Posted June 9, 2017 by Norburn Lighting and Bath Centre & filed under Events . 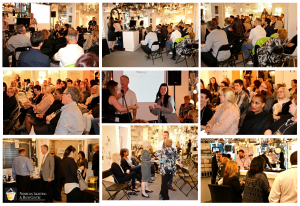 Last week we hosted our 5th Designer Night that focused on Innovations in Lighting. Ron Henderson, the founder of Varaluz, and Bryan Swindler, the Western Regional Sales Manager of Legrand were our guest speakers for the evening that provided insight on the latest in lighting design development and lighting control technology. 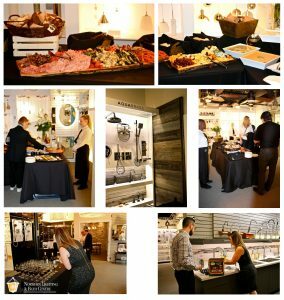 Over eighty guests attended and enjoyed refreshments and appetizers provided by The Butler Did It Catering Co and had a chance to networked with industry professionals. Our Sponsors also showcased some of their new and exciting products during the evening. Door prizes were also handed out during the night such as an iPad Mini, Celebration of Lights Dinner Cruise, Foodie Tour, Seaplane Tour, Bard-B-Q & Fireworks, Dinner & Comedy Show, and more. 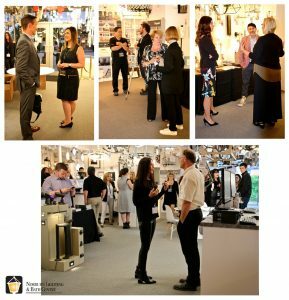 Ron Henderson is not only the owner, but is also highly immersed in every aspect of Varaluz, from product inspiration, design, manufacture and packaging. His extensive involvement at every phase of creating a product and his fierce environmentalism frames the workmanship and ethics of Varaluz, and makes him truly unique in the lighting industry. Bryan Swindler is the Western Regional Sales Manager of Legrand, and has spent much of his career with technology based products. His technical background offers insight to the future of Whole Home Products and the growing sophistication of wifi technology. Our night would not have been possible without the help of our staff and our sponsors. 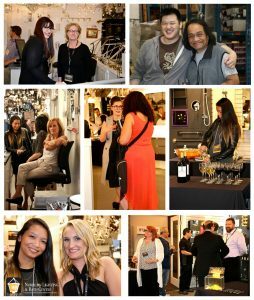 Special thank you to: Legrand, Varaluz, The Rubinet Faucet Company, Cerno, Tech Lighting, Kichler, Sonneman, Riobel, Kuzco, Fine Art Lamps, Wac, Maxilite, Hubbardton Forge, and Standard. We also thank everyone that attended and hope you enjoyed the evening as much as we did!